Thousands of goldfish have been removed from a pond in order to prevent environmental damage. 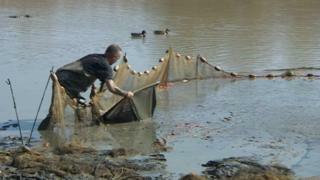 About 3,000 goldfish were discovered in Colliers Wood Pond, near Eastwood, Nottinghamshire. It thought the fish numbers grew from a handful of abandoned pets. People have been warned not to illegally dump their pets in waterways. Dumping invasive species in the wild contravenes Section 14 of the Wildlife and Countryside Act 1981. The Goldfish (Carrasius auratus) is a coldwater fish that can live for up to 15 years, and grow much larger than typical domestic pets kept in bowls and tanks. Females can breed several times during a summer, and are capable of producing thousands of offspring a year. Thousands of litres were pumped out of the pond to clear out the fish, which were causing environmental problems and overrunning native species. The animals were removed on Friday and will be sent to pet shops so they can find new homes. Mat Faulkner, from MF Aquatics, who carried out the clearing work on behalf of Broxtowe Borough Council, said the fish probably bred from a handful of pets abandoned in the waterways. "The banks have been eroded where they've been digging away looking for food," he said. "They'll eat tadpoles, small frogs, and invertebrates and insect life, which means you'll see a reduction in dragonflies and that kind of natural habitat, and in the numbers they're in here, en masse, they'll do that quite quickly and quite successfully."